Built in 1905, the Homestead is an old, summer boarding house converted to our home in the 1960's. We offer four individually decorated rooms, with lovely panoramic views of the ocean and shore hills; guests share two bathrooms, but each guestroom has it's own sink. Fireplaced living room, wood stove in barn-board dining room, sun deck, and front porch. The beach and ocean is a short walk from the door; or simply relax out back in the private garden. Continental breakfast served in dining room and on sun deck; dining room and large picture window with view of ocean; sun deck offers fresh sea breeze. Breakfast has distinct New England flavor, with muffins and coffee cakes baked with cranberries, rhubarb, maple, blueberries, etc. Attractions: Walk to Nubble Lighthouse, shoppes, restaurants; deep-sea fishing, whale watchs, island cruises, theater; within short driving distance is discount shopping at outlet malls and factory stores. Rates: $55 single; $65 double. 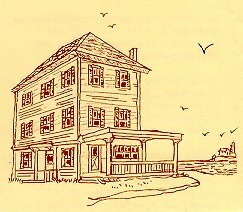 This and other Maine Bed and Breakfast Inns can be found here in The Register.